What seems to be a flurry of natural disasters within the past few weeks has led to catastrophic loss to our neighbors in the coastal cities to the east. Countless families have been uprooted with nothing left but a shell of what once was their homes. Oddly enough, it’s the tumultuous times we face that bring people closer together. As they reach out for a helping hand, it heartens us to see so many people, businesses and individuals, reaching back towards them in every form possible. People loaded up their boats and headed east en masse, shelters took in hundreds of dogs, and millions of dollars were raised to provide aid and support to those that needed it the most in the damaged areas. The call for help did not go unanswered. A group of local community members, including Lisa Vidaurri - a member of The Foundry Church in Escondido have put together a shipment of various supplies ranging from household goods like cleaning products, gloves, brooms, trash bags to construction equipment including tools and machinery. They came to us and asked for help getting it to Houston and we were thrilled to be able to pitch in and do what we can to help those in need. In just a few days, The Foundry’s sister church in Houston will be receiving not only diapers and dog food, but also hope to look forward to better days and strength to rebuild their community. If you are still looking for ways to help, check out this article from KUSI San Diego that lists many trusted local organizations such as the Rotary Clubs, Food Banks, Humane Societies, and the United Way who are accepting donations now. Even though the media buzz has calmed down, the need is still very strong. 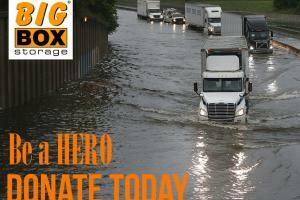 Please consider giving today, whether it is financially or through donating goods.